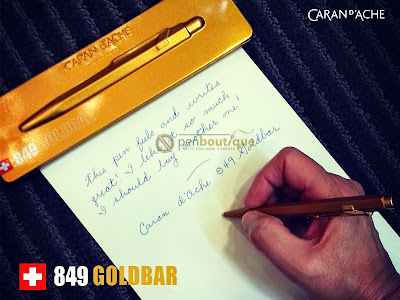 I have had a Caran d"Ache 849 Ballpoint pen for over a year and it has never let me down. The hexagonal shape, the unique click forwarding device, the finely engineered push button mechanism and its compact, but not too small, pen size makes this one of my favorite pens that is always ready to go. In fact, I liked it so much that when my nephew started college I gave him one as a gift. I enjoy color options with my ink refills. Monterverde Parker Style gel refills fit snuggly in this pen. This allows me some of my favorite options with Turquoise, Blue/Black and Purple readily available. The Caran d'Ache 849 Ballpoint pen now comes in a Goldbar design. It is coated in a gold-toned satin finish barrel and its fittings are plated with sparkling gold that easily pick-up the light. The outer box is almost as impressive, being made of the very same materials and resembling a gold bar. The box also sports a handy magnetic closing, so you can be assured that your writing instrument is secure. This beauty also has a gold plated clip which adds to its overall effect. No I do not NEED a new Caran d'Ache pen, but the ownership of this one is so inviting. I already know of the brand's reliability, so there is no trepidation in purchasing another. The time maybe now to treat myself to a gift!